The Judge Offers the GOP Some Terrible Advice | Dude, Where's My Freedom? Posted on January 28, 2013	by Dude Where's My Freedom? 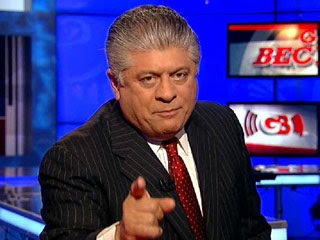 Judge Napolitano went on Varney and Company this morning to address the upcoming amnesty compromise, and coherently made the case for the libertarian argument against immigration control. He also encouraged the Republicans to hop on board the amnesty bandwagon in order to potentially win the votes of the millions of illegals who would become citizens under this plan. While I generally agree philosophically with the “natural rights argument” of open borders, I think the Judge’s political analysis of this issue is incredibly off-base, and that it would spell political suicide for the GOP to support such measures. The first issue is the media. Far from being honest journalists whose main objective is to fairly report events, they are mainly propagandists who attempt to advance ideological goals. The Judge is hoping that if the GOP endorsed amnesty from a natural rights argument, they would be properly recognized as having done so. No. Freaking. Chance. The mainstream/leftist media would simply characterize the event as racist, ignorant Republicans attempting to buy off the Hispanic vote by supporting a policy they obviously don’t believe in. Chris Matthews would cry out: “This is a cheap stunt by the racists! Don’t be stupid enough to buy it, Hispanics!” and they would in fact, not buy it. Meanwhile, the neocon media outlets would decry the GOP as a bunch of spineless cowards, liars, and hypocrites, and the move would do nothing but further alienate a large chunk of the Republican base. Do we think that Sean Hannity understands the nuances behind natural rights? Not a chance. He will declare any Republicans who support this measure as traitors, and the Democrats will happily watch and attempt to encourage the infighting that would ensue. The only cable news program that might possibly report on the natural rights issue at hand is Stossel. The second issue is the public itself. The reason the media doesn’t honestly report the truth is because the public isn’t particularly interested in an honest portrayal of the truth. They want their news to be spun in a politically partisan matter, and they aren’t particularly interested in having complex discussions about the role of government, the limitations of property rights, natural law, etc. The leftists want everyone to be equal, and the neocons want America to rule the world, and that’s about all they care about. Everything else is nuance which will be ignored. The third issue is the complete incompetence of the various prominent members of the GOP itself. Let’s say, hypothetically, that the Republicans really do believe in natural law and property rights, and as a result, they get together and agree unanimously to pass an amnesty bill. How do you think they communicate this policy shift to the American people? Do they send out Rand Paul (probably the only prominent Republican who might understand the implications and nuances of the philosophy) to explain to the public that the GOP has decided to embrace natural law and private property rights? Or do they send out Mitch McConnell and John Boehner to engage in pathetic racial pandering and nonsense made-up economic statistics (like a baseless promise that more immigration will “create jobs”)? Which do you think is more likely? Contrary to The Judge’s assertion that the GOP can create an environment more welcoming to illegals than the Democratic party, I assert that this is completely impossible. Regardless of what the GOP does, the media will work overtime to indoctrinate Hispanics into believing that Democrats love them and Republicans are racist, and it will continue to work. Embracing amnesty will simply alienate the social conservative voters and turn the GOP into an even more pathetic farce than it already is. Perhaps The Judge knows this, and is intentionally giving them bad advice in order to watch them destroy themselves more quickly, thus clearing the way for a true alternative, a political party that rejects the welfare/warfare state entirely, and stands for liberty and individual freedom. This entry was posted in News Commentary and tagged amnesty, compromise, Fox Business, GOP, immigration, media, natural rights, propaganda, rand paul, The Judge. Bookmark the permalink. Pingback: Amnesty: Still A Loser For Republicans | Dude, Where's My Freedom?